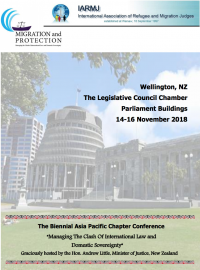 I am very pleased, on behalf of the Chapter Council, to invite you to register for the Biennial Asia Pacific Regional Conference in Wellington, New Zealand, on 14-16 November 2018. There will be a day of workshops on Wednesday 14 November, catering for both introductory/refresher needs and for advanced interests. The conference proper will be on 15-16 November, starting at an early hour with a powhiri (formal greeting ceremony) to welcome the manuhiri (visitors) to Parliament Buildings, where the conference will be held. Information about a Wine Walk in the fabulous Martinbrough wine district, scheduled for the day after the conference. The programme is exciting, the venue is spectacular and the city is charming. What more could you ask for? Well, make the conference the beginning of a vacation in New Zealand and there is plenty to do here. NZ will be coming into summer in November and there's no better time, before the Christmas break, to do some sightseeing. Looking forward to seeing you all in Wellington!